If everything were down to taste, including cost, that alone would explain why we often have to pay extra for salmon in our favorite restaurants and at the grocery store. When prepared properly, it’s hard to beat salmon as a main dish, which is why everyone would be wise to try cooking their own salmon fillets. You not only save money by staying in, but you also get to improve your skills in the kitchen and treat yourself to 30-dollar meals for less than half of that in the comfort of your own home. Luckily, this grilled salmon teriyaki recipe is a great place to start. Not only is it a shockingly easy dish to prepare, but it caramelizes the salty, sweet teriyaki flavor along with the fish’s oils, bringing in a marinade made even better with Manuka honey, ginger, lemon, and garlic. If you think you can handle the simple steps below, let’s get started on that salmon! Note: This dish also works well with other types of fish, but the cooking times will vary. 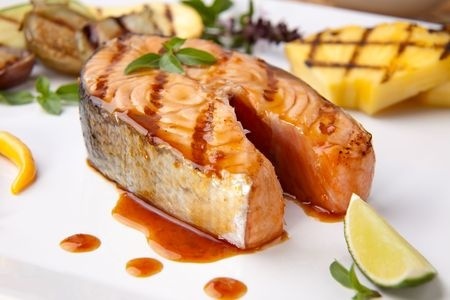 To start, whisk together the Manuka honey, the soy sauce, and the lemon juice (or mild vinegar) in a dish large enough to fit two pounds of salmon fillets. Mix in the garlic and the ginger. Set the fillets, with skin sides up, into the sauce, marinating for 10 minutes minimum or 30 minutes at most. Prepare coals very hot in an outside grill or preheat a broiler if you have one. Take the fillets out from your marinade, use paper towels to pat them dry, and place them with the skin sides down onto a grill gate or oiled pan. Note: Try brushing oil onto the salmon’s skin before placing the fillets on the grill, as this can ensure they don’t stick to the grate. Cook the fillets until they are somewhat firm to touch, which, depending on the thickness, should take between 10 and 15 minutes. While the fillets are cooking, brush them with the marinade a few times, so you can use the rest of it up. Once the salmon has finished cooking, immediately take the skin off while the fillets are hot. From here, serve your grilled salmon teriyaki at your own discretion!